Price has turned upwards as expected at the time of last analysis. I have two hourly wave counts for you today. Both expect upwards movement but they have different requirements. Summary: A clear breach of the trend channel on the main hourly chart provides me with confidence in a trend change. I expect upwards movement to continue for most likely about two weeks ending at or above 1,380.82, but there is a possibility it could be over within a few short days. This analysis is published about 04:35 p.m. EST. Click on charts to enlarge. The first upwards wave within primary wave 4 labeled intermediate wave (W) subdivides as a three wave zigzag. Primary wave 4 cannot be an unfolding zigzag because the first wave within a zigzag, wave A, must subdivide as a five. Primary wave 4 is most likely to be completing as a double combination: zigzag – X – second structure. The second structure labeled intermediate wave (Y) may be either a flat or a triangle. For both these structures minor wave A must be a three. This is my main wave count today because it fits nicely with my wave count for Silver. This main wave count expects upwards movement for about two weeks. If minor wave B is a flat then minute wave a within is a complete zigzag. Minute wave b may make a new high beyond the start of minute wave a at 1,392.30. This wave count has no upper invalidation point for this reason. Minute wave b within the flat correction must reach a minimum of 90% the length of minute wave a at 1,380.82. If minor wave B is an expanded flat correction then minute wave b may end at or above 1,398.80 where it would be 105% the length of minute wave a. Minute wave b within the flat may take the form of more than thirteen possible corrective structures. It is most likely to be a zigzag. At this stage the first five up is incomplete. I will not start to look at the different implications of various alternates until that is complete. Within the new upwards movement subminuette wave ii may not move beyond the start of subminuette wave i. This wave count is invalidated with movement below 1,277.79. If minor wave B is a double zigzag or double combination then within it the first structure of the double, a zigzag labeled minute wave w, is now complete. The double should be joined by a “three” in the opposite direction labeled minute wave x. There is no minimum upwards requirement for an X wave within doubles. Minute wave x may subdivide as any corrective structure. If minor wave B is a double zigzag I would expect minute wave x to be shallow. If minor wave B is a double combination I would expect minute wave x to be deep. The purpose of double zigzags is to deepen a correction when the first zigzag does not move price deep enough. Considering the lower target for minor wave B on the daily chart of 1,201.98 a double zigzag would nicely fit the purpose. This indicates a shallow X wave may unfold. The purpose of double combinations is different: they move price sideways to take up time. A double combination should not move price deep enough to reach the price requirement for minor wave B on the daily chart. This indicates a deep X wave is unlikely. The only reason today why this alternate has a lower probability than the main wave count is that it does not fit as well with Silver. If the main wave count is invalidated in the next few days with movement below 1,277.79 then this is the alternate I would use. Within the triangle one of the subwaves, intermediate wave (C), is a double zigzag. The remaining subwaves may not be double zigzags and must be single zigzags. If intermediate wave (D) is a zigzag then it is likely now to be over. This would be a remarkably shallow D wave within a triangle, and it does not look right. The probability of this alternate is today reduced. This alternate wave count now only requires a final zigzag upwards for intermediate wave (E) which may not move beyond the end of intermediate wave (C) above 1,392.30.
throwing in some fundamental analysis.. gold generally performs well in the months following July. If that plays out this year then we would expect to see a low around June/July. I’m not sure if there is enough time for primary 5 to play out by then so maybe we will see a longer B wave..
Lara, would be very helpful to see a current silver analysis to compare with gold analysis. 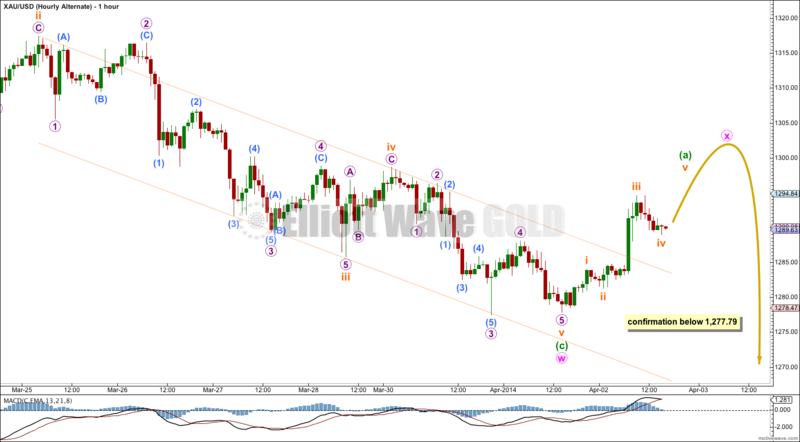 Help decide if gold will be moving up as an hourly primary chart b wave or hourly alternate chart x wave. I hope to get this done today. But my silver analysis will not answer your question. 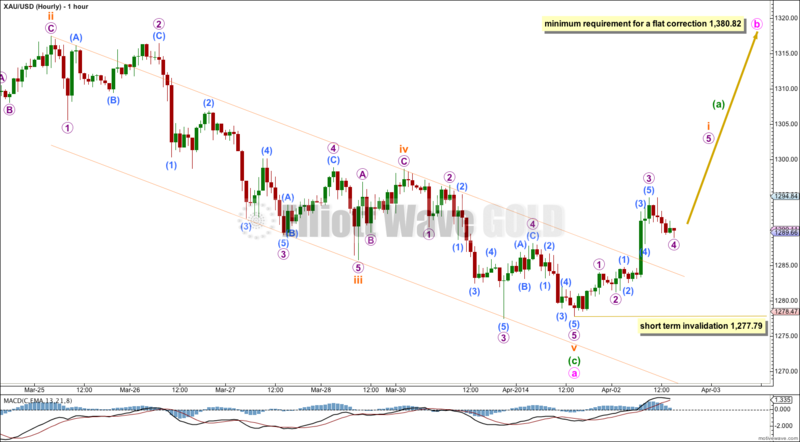 If gold moves up in an X wave it could last a few days and be very choppy and overlapping. 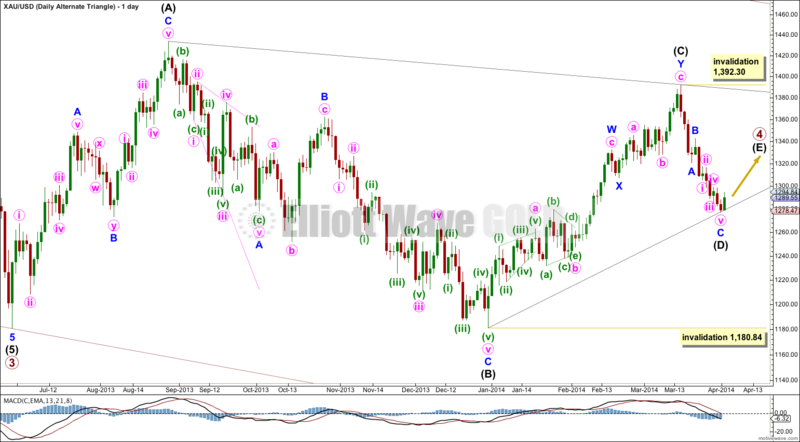 That would fit nicely with Silver moving up in a zigzag for it’s C wave of it’s triangle. 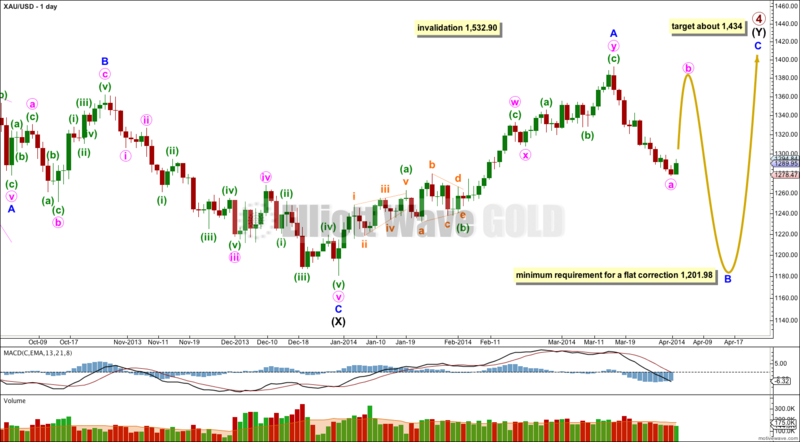 Or… Gold could move up in a zigzag for a B wave of an expanded flat and reach 1,380 or above, lasting about two weeks, while Silver does a longer lasting zigzag of about the same duration. That would also fit. It’s a B wave. They’re the most difficult of all waves to analyse. Furthermore, it’s a B wave within a B wave… within a combination! If I can get it right for you I’ll be mightily impressed. Thanks, you have an incredible EW mind. Me, I have a simple EW mind and I do not carry your burden of detailed analysis, so if I see both gold and silver moving roughly congruent I have more confidence in the move. In this case the big question for me is–will gold have a short rise for a few days or longer rise for a few weeks? Since EW analysis in this situation is hazy with many possibilities maybe gold’s little brother silver will tell us what gold will do? We ask them separately and see if they give us the same answer.